Jet Airways Ltd has agreed to most conditions set by shareholder Etihad Airways for offering a lifeline to the debt-laden Indian carrier, the Business Standard newspaper said, sending Jet's shares soaring as much as 18 per cent on Friday. Both airlines are set to sign a memorandum of understanding (MoU) within days, which would result in Jet Airways' founder and chairman Naresh Goyal reducing his stake to 22 per cent from 51 per cent and stepping down from the board, the report said, citing sources. Etihad's stake would go up to 40 per cent from 24 per cent and the lenders would convert some of their debt to equity, giving them about 30 per cent ownership of the cash-strapped carrier, the newspaper reported. Jet Airways said in a statement to the stock exchange that, as previously stated, the airline is working on a comprehensive resolution plan with lenders, led by State Bank of India (SBI), and other stakeholders. Saddled with a debt of about $1.14 billion, Jet Airways has been hit by fierce competition, rupee depreciation and high oil prices. The airline, which controls a sixth of India's booming aviation market, owes money to banks, vendors and lessors - some of whom are considering taking back aircraft, sources have told Reuters. Jet said on Monday it would seek shareholder approval next month to convert existing debt into equity and allow its lenders to nominate directors to its board, in an effort to resolve its financial issues. SBI chairman Rajnish Kumar told reporters on Friday that efforts are on to resolve Jet's situation but declined to comment on how much stake the bank would end up taking if the debt for equity swap is approved. Jet Airways is also behind on salary payments to pilots. The airline had agreed to pay the outstanding 25 per cent of salary for October and 75 per cent of November in January, while the remaining would be cleared in tranches by April. 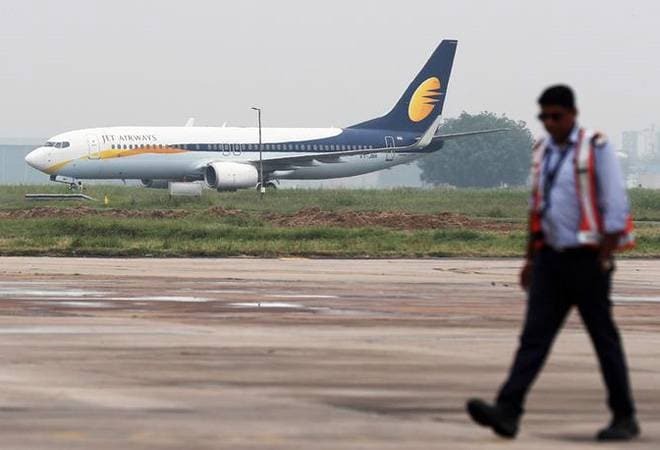 While it has cleared dues for October, Jet has only paid 50 per cent of the salary for November, two sources told Reuters, adding that the pilot's union is expected to meet with the management next week to discuss the issue. In a letter to employees on Thursday, Jet Airways CEO Vinay Dube said that the airline's key stakeholders are "actively engaged" towards finalization of a resolution plan and an outcome is "very close". "Our chairman, the board of directors and your management team are working hard on a balance sheet transaction that will help us eliminate our current challenges," Dube said in the letter, the contents of which were viewed by Reuters. "We are working as fast as we can for a successful outcome," Dube said, asking employees to be patient and warning that it might get tougher before it gets better. The airline's directors are expected to discuss the legal formalities of the deal and other details at a board meeting on Feb. 14, the newspaper reported, adding that if Jet agrees to the terms, Etihad is willing to pump in $35 million immediately.